Mood board: For A/W 2017, Chitose Abe was preoccupied with the archetypal pieces of a woman’s wardrobe. Renowned for her hybrid take on design, combining silhouettes into new and distinctive forms, the designer reworked these traditional shapes spanning day to night – her opening look a pyjama-style suit with floral embroidery and a plethora of zips, or a high-performance ski knit, beaded and bejewelled with evening wear inspired attention. Military silhouettes – a Sacai signature, from MA1 bomber jackets, to double-breasted coats – were also in attendance, and alongside padding, tweeds, furs and plaids, Levi’s denim was also used, imagined in long skirts with sheer panels and gently flaring zipped jeans. Best in show: The epitome of Abe’s hybridising aesthetic, a double-breasted coat with shining gold buttons featured double-sleeve cuffs, one pair rolled up to reveal a second MA1 bomber jacket sleeve in shiny khaki nylon. Another outerwear piece, a plaid cape, tapped into Abe’s ski-focused vision, and featured both elegant fringing and a raincoat-like yellow hood, lined with shearling. Team work: Abe collaborated with Linda Farrow on sunglass frames which emphasised her interest in alpine imagery. 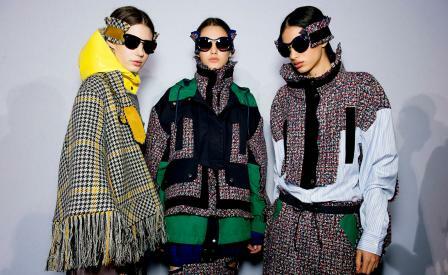 The ovular and aviator styles resembled the shapes of ski goggles, with elasticated head-band details in different tweeds. Last season, the designer also debuted her bag collection with Katie Hillier, and her second collection also featured on the runway, with new styles including a hard beauty case (with studs and a shoulder strap) and a high-shine tote, inspired by recycling bags.